Orange Dog Leash built with 10.5mm mountain climbing rope & 316 stainless steel clip. An Optional Carabiner is available. The best dog leashes come in a variety of different colors and designs. 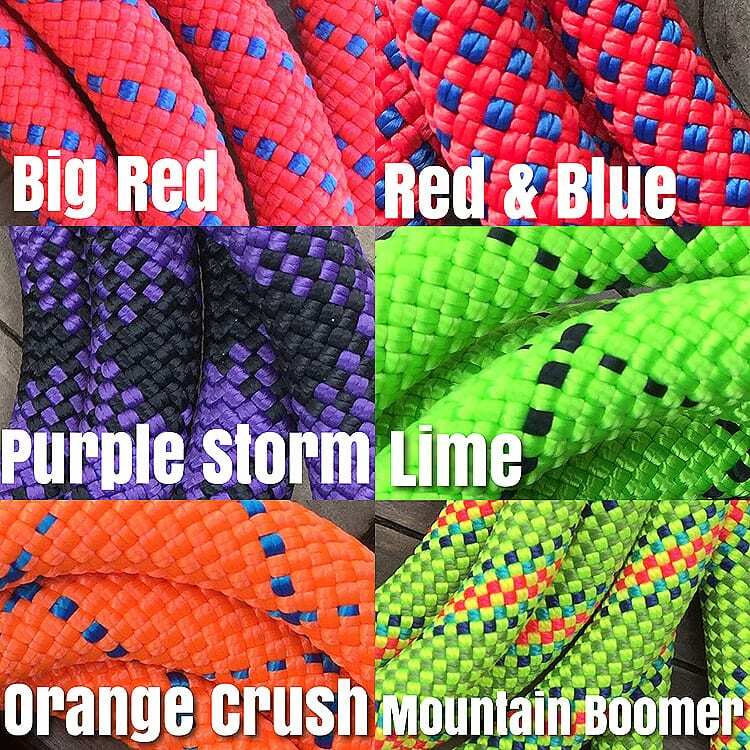 Mountain Climbing Rope is unique and offers superior strength, durability and a range of colors not always found in pet store dog leashes. The high visibility orange works well for evening dog walks. Leash construction is important. We use customized aluminum rope connections for a permanent fit. 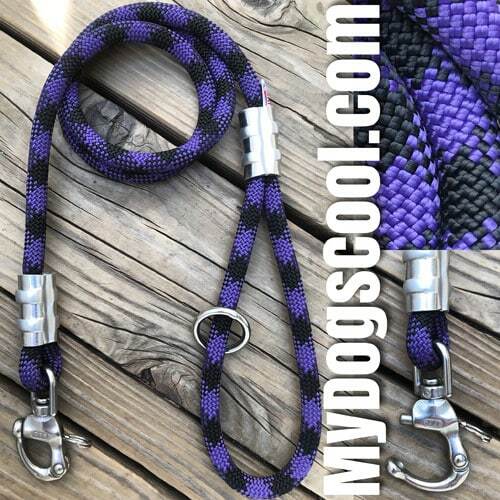 Our customized connections are original to MyDogsCool.com. If you see what appears to be our leash design under a different name, it’s a copy. 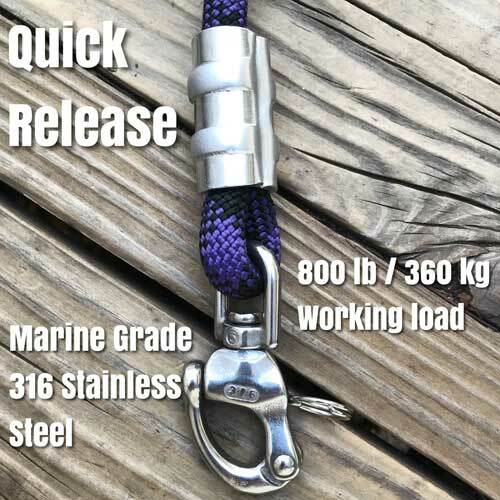 Marine grade 316 stainless steel clips are a great choice for most medium to extra large dogs. These have 180lb working load and considerably stronger than similar styled clips seen on most dog leashes. For added strength and safety carabiners are a good choice. 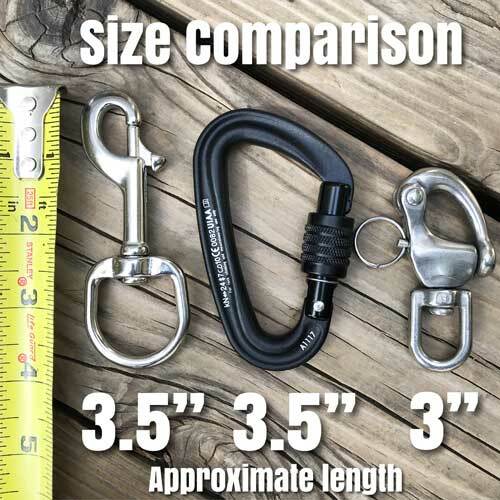 For strong dogs that may require leash training, or if a concern exist with an overly excitable or aggressive dog; a carabiner is also a good choice. You wont have the swivel ability like a regular clip. 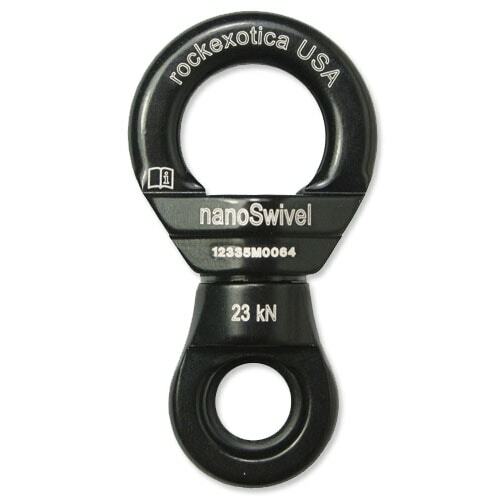 If you need both the carabiner and the swivel action, you may need to consider upgrading your leash with a nanoSwivel & carabiner combination. To learn more about the clips we use please read The Best Dog Leash. The Orange Dog Leash is a Limited Edition, and expected to be a popular choice helping with our efforts to raise funds for local no kill shelters. Dogs deserve the best, we think you will find our dog leashes are among the best made in USA. A great basic leash, carefully constructed with quality materials. There are a lot of look-a-like "climbing rope" leashes out there, poorly constructed with utility rope and cheap hardware which put your dog at risk. And then there are all the over designed, 6 -10 way, all the bells and whistles gimmicky leashes. This leash is not one of those. This is the real deal, built for strength and function. The authentic climbing rope provides a secure grip and is comfortable in hand. 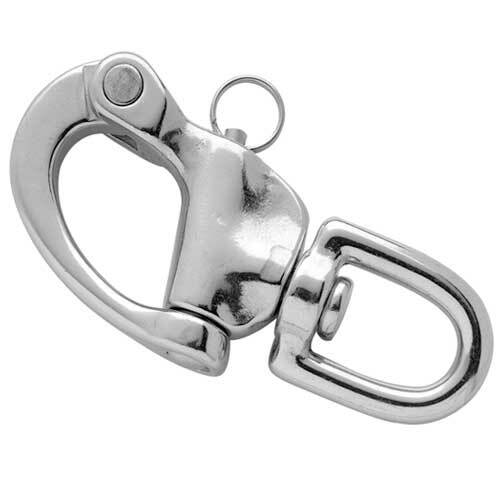 The real climbing carabiner ( no key clips here) is substantial and easy to clip on and off even the thickest collar rings. I've worked with dogs for over 25 years and never thought I could be swayed away from my basic leather or home-made webbing leads, but this leash has become one of my "go to" everyday leads. Now I have a lead that is not only safe, reliable and easy to handle, but looks really cool too! I must say that the styling and bright colors drew me to these leashes. But it is the quality of construction and the attention to detail, by an entrepreneur who obviously has a passion for his product and a concern for his customers, that will keep me coming back for more. I have had many dogs and therefore have owned many leashes. 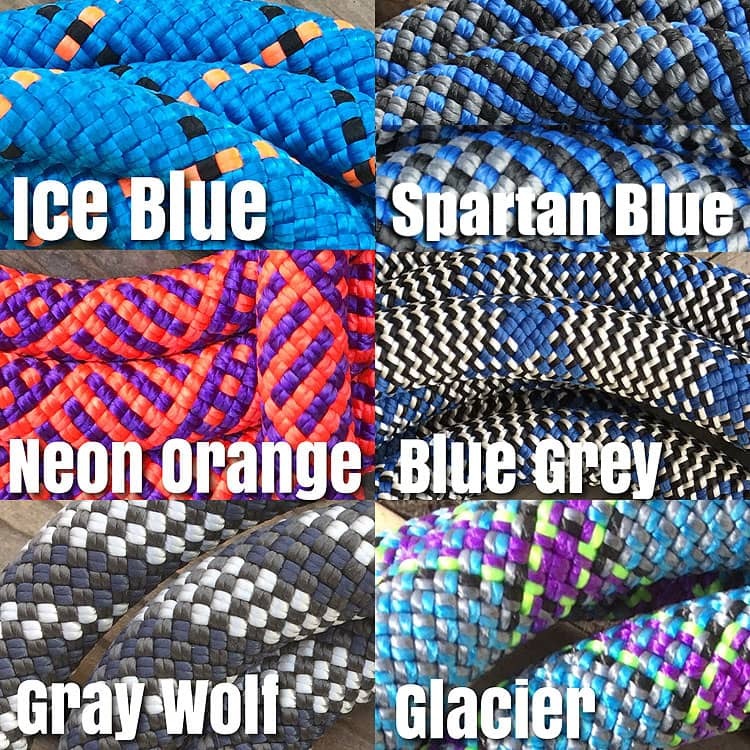 The climbing rope dog leashes I just purchased from mydogscool.com are by far the best I have owned. The attention to detail and quality of the hardware is far superior to what you find in pet stores. These are the only leashes I will buy from now on!